The staggering first appearance of…the Goat! 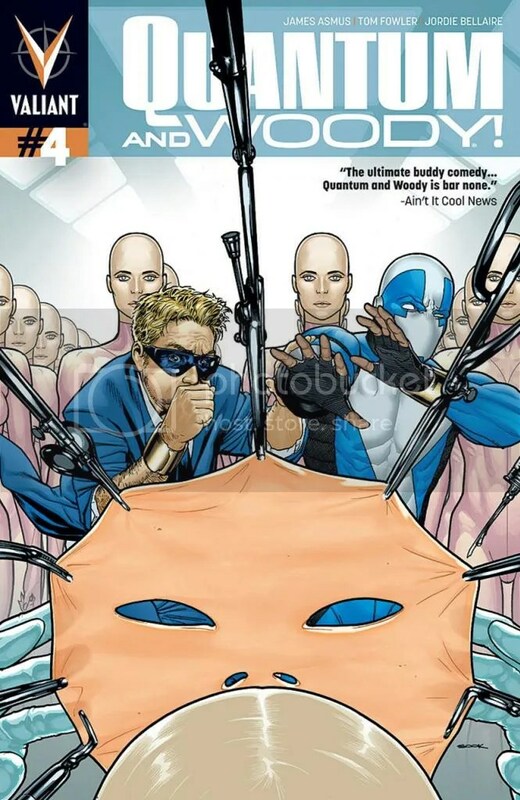 Bitterly divided and hopelessly outgunned, Quantum and Woody are getting torn apart! Literally! Can they get their #$@% together before being shredded to atoms by the mysterious Crone and her super-science foot soldiers?! Probably not. But when a new ally emerges from the shadows, they’ll find the strength to fight baaaaack. As of last issue, Woody is being held captive by The Crone, the extremely old and creepy-looking woman who leads the E.R.A., Edison’s Radical Acquisitions, the secret cabal that steals and hoards advanced scientific discoveries. Quantum sneaks on to the private Island where the E.R.A. is based, not knowing that Woody is there, or that he’s walking straight into The Crone’s army of heavily armed genetic clones (which includes Detective Cejudo, who was really working for The Crone all along). We get some more background into the formation of the E.R.A., and how The Crone got involved. The issue is chock-full of high-concepts, there’s Beta-Max the cyborg whose parts haven’t been updated since the 1980’s, Haz-Matt, the radioactive man, along with Johnny 1 and Johnny 2 from issue #2 and the big guy who we saw kill Derek in issue, 1, who is called The Russian, and has a bit of as surprise himself. Quantum unleashes all of the monstrous genetic freaks that The Clone was keeping locked up, the most dangerous of which is The Goat, and uses the distraction to free Woody. After a major battle, and some deep conversation between the leads where they come to an understanding of their childhood, and reconcile as brothers, Quantum and Woody reunite, defeat the Crone, and get Detective Cejuda to clear their names in the death of their father. All’s well that ends well, at least until the next issue. Available digitally on COMIXOLOGY and in print at your local comic-shop (probably).